England 5-186 (Alastair Cook 46, Eoin Morgan 39, Tim Southee 3-48) beat New Zealand 185 (Brendan McCullum 79, Ross Taylor 28, Steven Finn 3-27) by five wickets. A lethal bowling spell from the speedster Steven Finn, well supported by the other bowlers and keen batting by the English batsmen won them the third ODI vs. the Kiwis. New Zealand was bowled out for 185 runs with 6.1 overs to spare and England smashed 186 in 37.3 overs for the loss of five wickets. The third and final One Day International of the series was played on Saturday, February 23, 2013, at Eden Park, Auckland. Earlier, the captain of England, Alastair Cook, won the toss and elected to field first. The decision proved right as Steven Finn got rid of the openers and James Anderson got the third wicket as the home side was reeling at 3-11 in 7.2 overs. The opening batsmen, BJ Watling and Hamish Rutherford surrendered against Finn for 1 and 2 runs respectively whereas Kane Williamson became the victim of Anderson for 7 runs. Ross Taylor and Grant Elliott tried to negotiate the destructive bowling from the rival bowlers but found it hard to score the runs freely. The pair crawled to 57 after 20 overs with two boundaries each from both batsmen and they took the score to 64 in 22.4 overs. Elliott was unluckily run out for 24 and was replaced by their skipper, Brendon McCullum. Taylor was caught behind by Jos Buttler off Stuart Broad for 28 after the addition of just three runs to the total. It was left to McCullum to get some respectable score on board and he hit the first six of the innings in the 32nd over. He was the main scorer as the wickets kept on crumbling from the other end and the first hundred of the innings was posted on board in the 34th over. Brendon McCullum added 15 runs in the 38th over with 1 six and 2 fours and completed his 25th ODI fifty two overs later. He was the last batsman who went back to the dressing room for 79 off just 68 balls with 5 towering sixes and 6 fours as the entire home side was bowled out for 185 in 43.5 overs. Steven Finn broke the back of the rival batting by grabbing three wickets, Stuart Broad and Graeme Swann shared two each whereas James Anderson and Chris Woakes claimed one wicket each. Alastair Cook and Ian Bell responded to the challenge positively as the latter hit 1 six and 2 fours in the 3rd and 4th over. Cook reacted with a couple of fours in the next over and the first wicket fell at 42 in 6.3 overs when Bell was gone for 24 runs. Jonathan Trott joined in with Cook and they kept the score board alive as the ball was touching the ropes at regular intervals. The score went past the 100 runs mark in the 20th over and Trott became the next victim at 109 after contributing 38 off 44 balls with 4 fours. Alastair Cook followed him three runs later for 46 from 67 with 5 fours as Joe Root and Eoin Morgan associated at the wicket. The pace of scoring was lifted as Morgan hit two consecutive fours in the 26th over. He dispatched 11 runs two overs later with 1 six and 1 four and repeated the same feat in the 32nd over. Eoin Morgan was caught by Kyle Mills at deep backward point off Andrew Ellis for 39 from 24 mere balls with 2 lofty sixes and 5 fours. Joe Root remained unbeaten for 28 as England achieved the target by scoring 186 runs with five wickets still in hand and 12.3 overs still available. Tim Southee was the supreme bowler with three wickets whereas Andrew Ellis ended up with two. 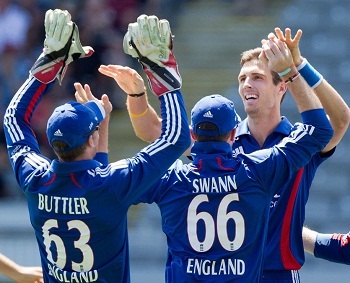 England clinched the third One Day International with a big margin of five wickets and lifted the series 2-1.